Twin car 671+681 started life in 1960s painted in the standard cream livery, though this was not the start of the set. 671 started life in the 1930s as a single Railcoach with pointed cab ends, numbered 281 and was a regular in service since the date delivered. Painted in the standard 1930s Green and Cream, 281 was operating along alongside a wide variety of trams such as Boat, Brush, Balloon, Dreadnoughts and Toastracks. Railcoach 281’s life was pretty much the same until the 1950s where Joseph Franklin had the idea of converting some trams to run with trailers. The first of these to be trailed for conversion were similar trams 275 and 276 in 1957 which involved converting the ends to be flat in order to be suitable for coupling. By 1958 the Twin car project was given the clear and construction began on converting railcoaches to flat ends while 10 trailers had been built-in the Midlands, numbered T1 – T10 and delivered to Blackpool Transport from 1958 onwards. At this time any trailer could be attached to any motor car, meaning there was not a certain set as there is today although the first were 277+T1 as all others were in the process of being completed. 281 was a later of the conversions and re-entered service in 1960s. With the trailer cars not being equipped with driving motors they were only allowed to be on the back of the set and could therefore only be operated on loop runs which considerably reduced the flexibility of the set. Moving on into the late 1960s it was decided to permanently couple the motor cars and trailers into sets of two and equip the trailing cars with controllers. This therefore meant trailers could be leading and they could go to most destinations and reverse over the crossover along with every other class of tram. 7 Sets were converted in total with 281 being one of the latter leaving three railcoaches operating singly while the remaining trailers were left in depot and scrapped giving them a very short life. With much work put into these twin sets and a renumbering of all cars (281 to 671 and T1 to 881 creating 671+681) it was surprising to see their use was very little and they were generally restricted to Summer and Autumn months. In 2003 671+681 was repainted out of its green and cream livery and into Metro Coastlines Green representing the bus livery of Line 2 which it still carries to date. 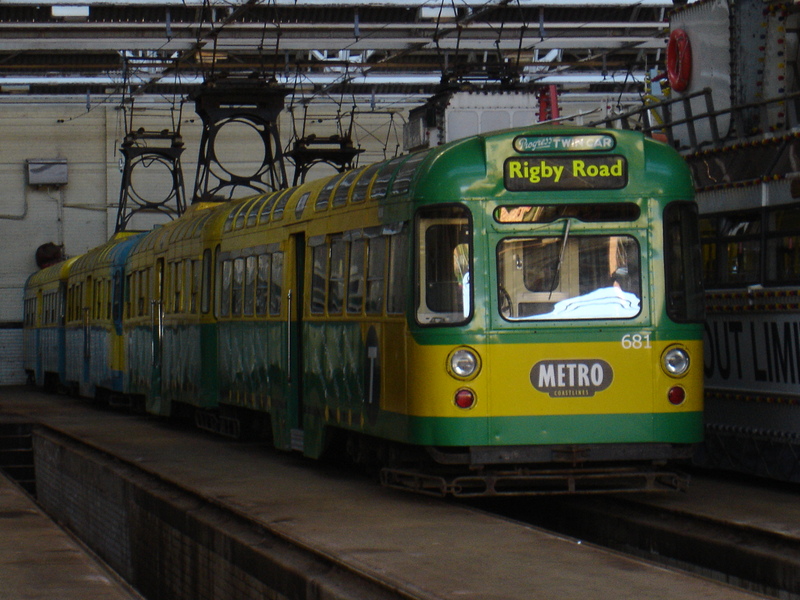 For the following years the set continued to see very limited usage and was withdrawn at the end of the 2007 Season which was originally thought to be the last ever usage of the set in Blackpool. In 2010 671+681 briefly returned to service to operate the Autumn Illuminations due to a shortage of trams which was caused be many Balloons and Millennium cars out of use for door modifications. Today 671+681’s life in Blackpool seems to have eventually came to an end with the tram once again withdrawn and is not expected to be allowed in service this year due to not having transponders. The future is currently unknown with the set being sold to an unknown buyer, so although its operational life has most likely came to an end at least it will be around in the future. Surely you meant to say that the trailer cars were fitted with a driver’s position/cab and controller-they’ve never had motors. Sorry for the delay in response. You are correct, I was meant to say controllers instead of motors which has now been changed.